The Real Monarch of the Glen? I caught a trailer on the BBC yesterday for a programme coming soon about the owner of the Alldale Estate in the Highlands. It is a six part series beginning on 7th July on BBC Scotland 2. For those outside Scotland it will be available on BBCi player or cable/satellite TV. No doubt it will focus on his attempts to reintroduce extinct wild animals to the Highlands as part of a “game” reserve scheme. On another blog I wrote the post below about a previous prorgamme aired on 16th April 2008. I hope this time the BBC will be less biased but I doubt it. “Watching last night’s Natural World programme on BBC2, I had expected a balanced assessment of plans to introduce animal species to the Alladale estate that are currently extinct in Scotland. Instead we got the views of the landowner, the estate manager, two estate workers, the estate’s environmental consultant, a reserve owner from South Africa and several others who were in favour of creating a 23,000 acre Higland Game Reserve. The narrator treated us to a commentary describing the great benefits of reintroducing moose, brown bears, lynx, wild boar and wolves would bring. The only dissenting voice was the excellent Cameron Macneish who had less than a minute to explain his opposition. It is a pity the BBC decided to produce such a biased programme about an environmental issue that could have an enormous effect on a Highland wilderness, when a balanced approach was needed. I agree with him about the Grahams, I only know one person who systematically ticked the Grahams but plenty of people who are also doing Corbetts, many of them alongside their Munro bagging. I had hoped to go walking this afternoon but the remnants of my cold and the wet gloomy weather has put me off. Instead I have been playing around on the internet and have come across two new features at www.walkhighlands.co.uk. This is a great website that goes from strength to strength, with updates to their walking routes and new features being added. Two new features have recently gone live. Using Google Earth you are now able to visualise the walking routes on offer through a plug-in called Virtual Highlands. I have had a go and I am not convinced. I think options included in mapping software like Memory Map is far more useful in visualising your route. Also this seems a rather slow and blocky application to use. Perhaps, I just don’t understand it but I think I will be sticking with the follow route option in Memory Map. The website has a new Munro section which has a useful little feature where you can log your Munro conquests on a google map. I use www.munromagic.com to log my ascents of both Munros and Corbetts but this is a useful visual indicator of which summits I have climbed and where I need to go in the future. It will supplement munromagic but won’t replace. I have asked Paul Webster at walkhighlands whether there are any plans to include a Corbett feature as many Munroists are also logging Corbetts at the same time. A group of us journeyed to the remote graveyard below the Blackwater Dam yesterday evening, to remember those men and women who lived and worked there during its construction. Some of us traveled by foot walking along the conduit others were ferried all the way courtesy of Alcan in their estate land rovers. 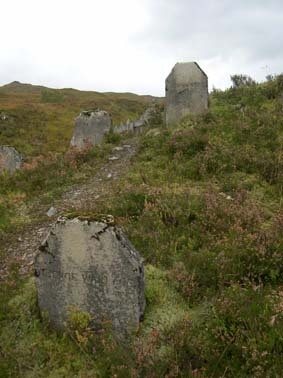 The initial idea was that of Kinlochleven resident and keen hill walker, Arthur Custance, who had noticed that the grave of an unknown worker had the date of 26th June 1908 on it. He approached me earlier in the year to see if the Community Trust could organise a commemorative service on the hundredth anniversary of that workers death. Led by the Rev Donald Davidson, who also works for Alcan Estates, we held a poignant service in this remote and bleak place. We remembered all those who had died during the dam’s construction and reflected on the harsh lives of those navies that worked and lived there. Alcan Estates not only provided transport for the less able (and the able!) but had also worked on tidying the area, with the overgrown heather around the gravestones being removed, a new perimeter fence and a raised approach path through some boggy ground. I hope that we can place a permanent information panel close to the graveyard so that those walkers who come across it can understand why it is there and appreciate the condition in which the workers lived. I will try and put up a route of the walk over the weekend so that other people can visit. That’s the behind the scenes things completed. So another blog is launched into the big bad world, ready to be swallowed up by the blogosphere. Only love, nurturing and regular posts will insure that it lasts for any length of time. Good luck my friend!